This is a visual novel engine – used by thousands of creators from around the world – that helps you use words, images, and sounds to tell interactive stories that run on computers and mobile devices. These can be both visual novels and life simulation games. The easy to learn script language allows anyone to efficiently write large visual novels, while its Python scripting is enough for complex simulation games. 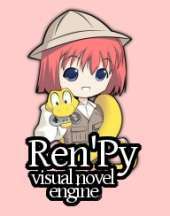 Ren'Py is open source and free for commercial use. It has has proved attractive to English-language hobbyists and has been used to create over 1,500 visual novels, games, and other works. It includes the ability to create branching stories, save file systems, rollback to previous points in the story, a variety of scene transitions, DLC, and so on. The engine also allows for movie playback for both full-screen movies and animated sprites, in-engine animation (using the built in "Animation and Translation Language", or ATL), and full animation and customization of UI elements via "Screen Language". Ren'Py scripts have a screenplay-like syntax, and can also include blocks of Python code to allow advanced users to add new features of their own. In addition, tools are included in the engine distribution to obfuscate scripts and archive game assets to mitigate copyright infringement.